Today was our first whole day in San Francisco! And what a full day it was. We drove to the closest BART Station to our campground and parked the rv for the day there. 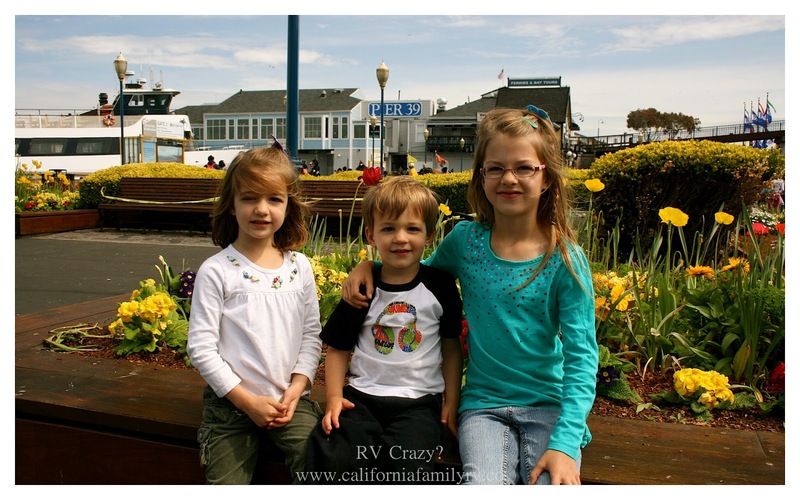 We can easily fit into one parking space, but they do allow larger rv's to park in multiple spaces (as long as you pay for each spot). We walked into the station and purchased train tickets for the BART. It was kind of confusing, but we eventually sorted it out and got on the correct train. 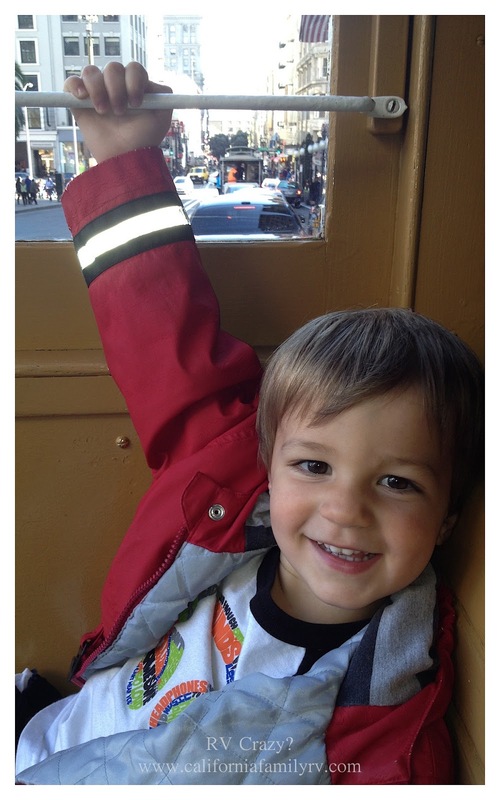 Our kids were thrilled to be on a train of any type. I was less than thrilled with the sleeping guy in hospital socks sprawled out on the seat behind us, but none of the regular-looking commuters seemed to pay it any notice, so I tried to just "go with the flow." The majority of passengers appeared to be commuting to work. The kids were excited to watch the sights flash past us, and it was fun to see the colorful San Francisco style houses all over the hilltops on our way to the city. One of my favorite houses. 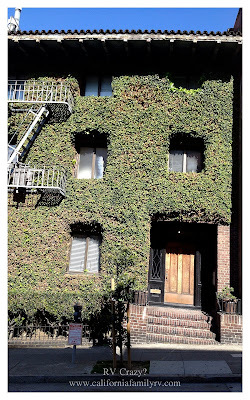 I just love the ivy all over it. When we arrived, there was a huge line for cable car tickets, so I got in line with our youngest, while my husband got in the other long line to actually board the cable cars. I waited for about 30 minutes to purchase tickets, and another half an hour with the rest of my family to board the cars. This is definitely not the most efficient way of transportation. It's quaint, and very memorable, and the kids love it. 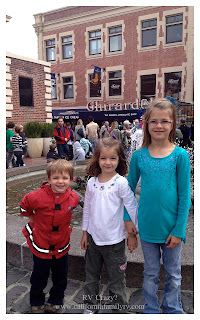 So we put up with the long waits, especially since the kids were behaving exceptionally well. When it was finally time to board, we were right behind a man holding a baby, so of course I didn't rush him. The lady behind me didn't have the same qualms, so she shoved her way past, and jumped into one of the outside benches, and tried to save seats for the people with her. Thus, I was seated smashed next to my 7 year old with both 2 and 4 year old kids on my lap and my husband was hanging from the outside pole. Not exactly comfy, but it was memorable! We rode the Powell/Mason line down to Fisherman's Wharf. Fisherman's Wharf never disappoints. From the street performers (the kids roared with laughter after one camouflaged by leaves jumped out and scared the bejeezus out of me), to the boats, the museums and submarines, the smell of fresh Boudin's bread baking, and the sound of the barking sea lions, there is always plenty of excitement! 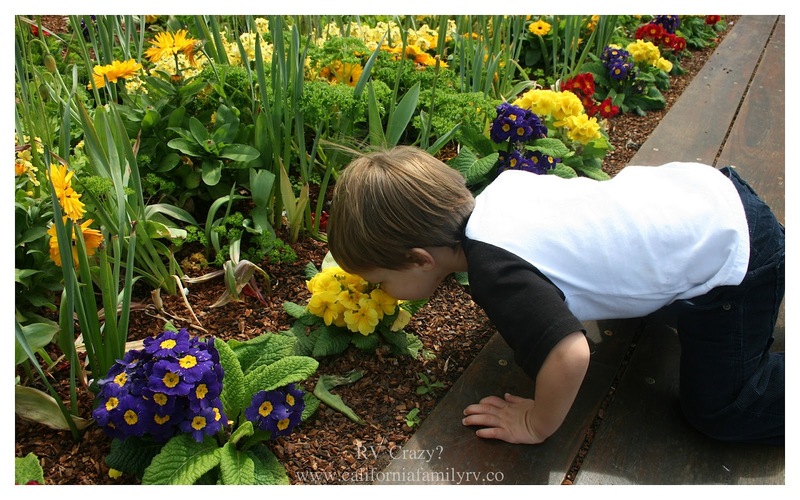 Our kids loved the brightly blooming flowers, and stopped to smell most of them. 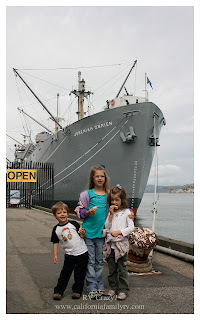 Maritime museums. You can pay to board the boats, or just wander and look for free. Don't forget to stop and smell the flowers. All the flowers. They didn't. Kids lounging on a bench I remember sitting on many years ago..
...and there it is...complete with bad hair & outfit. Good times. 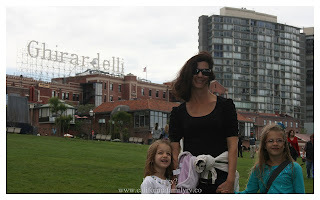 We popped in to Ghirardelli Square to try some chocolates and look around. It smelled heavenly! More great news (for us) Ghirardelli uses real, fine ingredients in their chocolate, so all of us could enjoy the delicious candy. We bought extra to bring home with us for later. 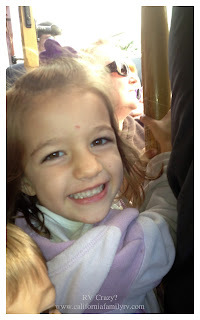 Well, our middle sweetie had begged to ride on the cable cars and hang on to one of the outside poles. In fact, she had put it on our "Family Wish List" (kind of like a bucket list of family goals to do or see) months prior to our San Francisco Trip. The first cable car ride was much too crowded for her to attempt this, so we decided to go for another try. We got in line and the attendant told us it would be at least an hour wait. 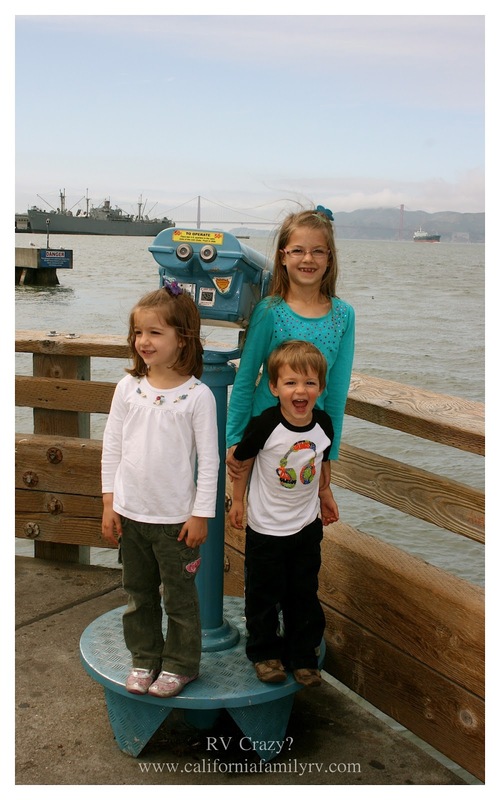 We checked with the kids to see if they really wanted to do this again, and they were all adamant that they wanted to wait. And you know when you know your kids really well, and you know they will hate waiting for an hour in the hot sun? Well, they always prove you wrong, don't they? 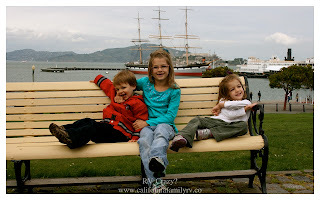 Our kids were awesome. I didn't even have to pull out movies or games or anything. They were so good. Just when I think I have them figured out...haha. This time we wanted to ride the Powell-Hyde line and hoped to stop at the Cable Car museum on the way back to the BART Station. This cable car experience couldn't have been more different than our first. The lady in front of us scooted over, and we made room for her family as well. 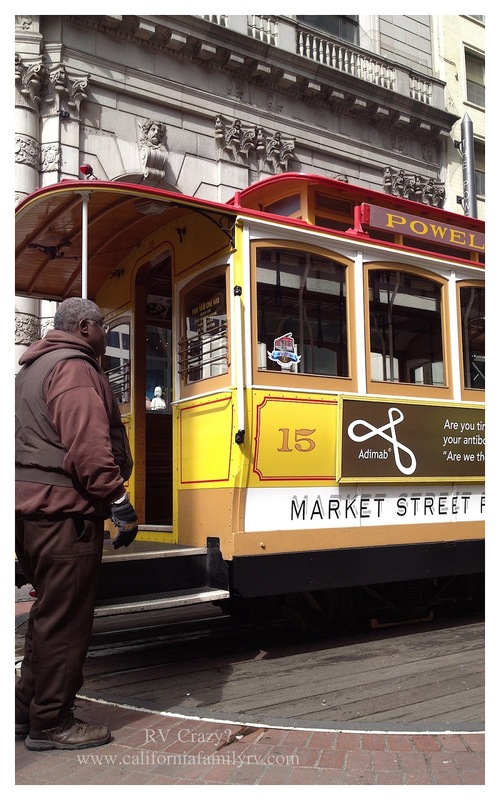 The gripman was friendly and played music on the cable car bell. All of the riders were friendly and excited to be there. A much better experience. And our sweet, excited girl actually got to hang off the side of the car (with Dad's supervision of course)! This ride was very fun! This route went over all the huge hills that I remembered riding on when I was little. And the views were spectacular. I'm so glad we waited for that second ride. It was so much fun! 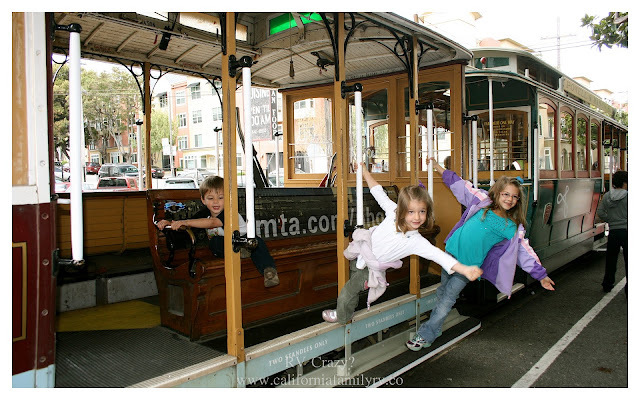 We ended up just riding all the way to the end of the line, because by the time we arrived at the Cable Car Museum, it was only a half an hour before close, and the kids were tired, and we were afraid of not being able to catch another car. So we will save the museum for the next trip! I'd say today was very full and very fantastic. I think he would too! Believe it or not, I have a certificate somewhere in a box proving that I rode BART the first day it opened. I worked on California Street so I rode the Cable Cars all the time. It was the easiest way to get up California to other offices I needed to go to. 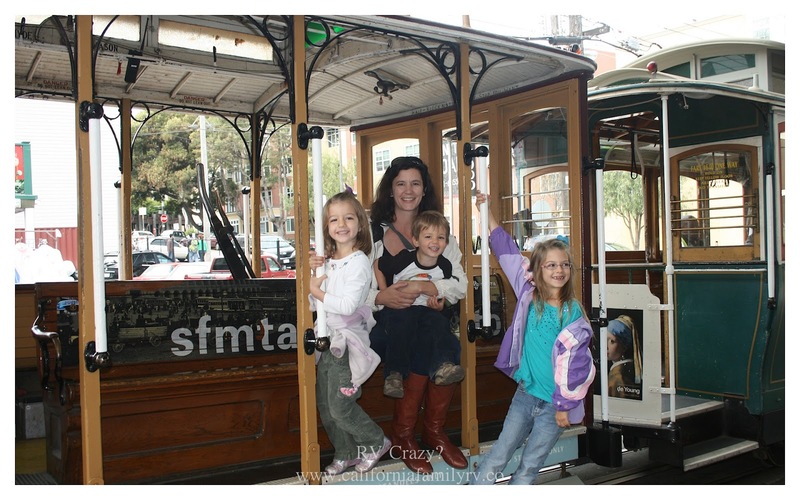 The Cable Cars cost .25 cents and you didn't buy a ticket. You just dropped a quarter in the money box. I'm getting too damn old! 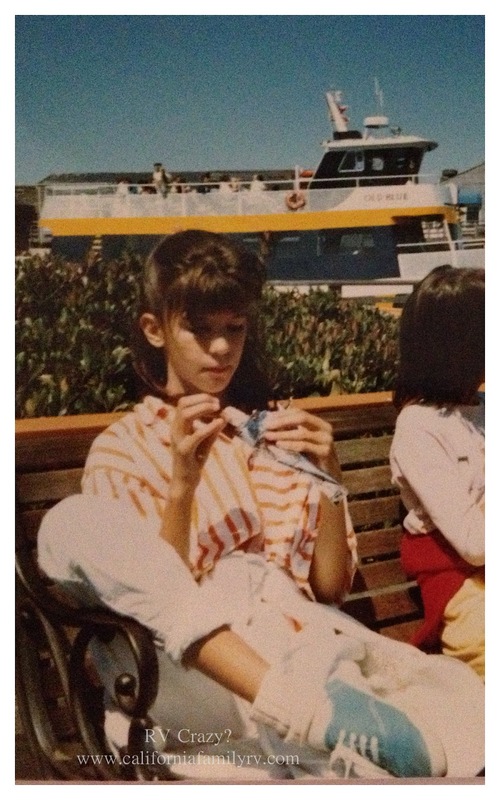 Love the photo of you sitting on the bench!